Ever since 1989, BAOCHENG ENTERPRISE CO., LTD., formally known Sincere Metal Ent. 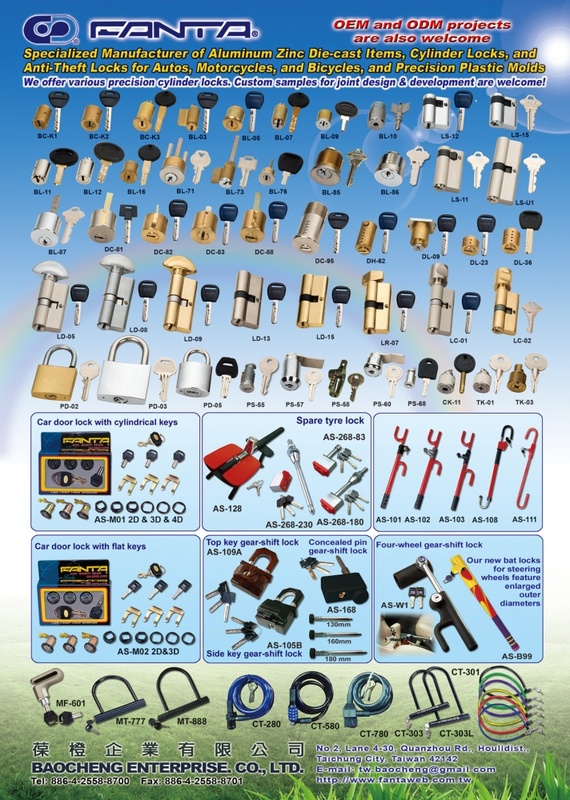 Co., Ltd., has been dedicated to "Metal Forming, Motorcycle Parts, Motorcycle Accessories, Central Power Locks, Alarm Systems, Anti-Theft Devices, Steering Wheel Locks, Gear Locks, Other Interior Accessories, Other Locks, Spare Tire Locks, Gear Shift Locks, Cylinder Locks, Cane Lock, Car Door Locks, Spare Tyre Locks, Bicycle Locks, Car Four-wheel Locks, Motorcycle Locks, Gear-shift Locks, Brass Bicycle Locks, Side Key Gear Shift Locks, Pressing-type Four Hooks, Theft-proof Steering Wheel Locks, Bat Steering Wheel Locks, Motorcycle Card Locks, Motorcycle Security Locks, Top Key Gear-shift Locks, and plastic, zinc alloy mould, aluminum mould development and manufacturing" with operations in Taiwan. The offering of drawings and prototypes for joint development of new products is welcome.